We’re very proud to present our Co-Founder and Managing Director Katharina Paoli as one of the Keynote speakers at the ChangeNOW international summit for change in Paris. The summit is this weekend, and it’s one of the biggest sustainability summits in Europe, attracting environmental enthusiasts from all over the globe. The summit pays homage to all the inspiring individuals inventing new solutions, rethinking businesses, and challenging the status quo. 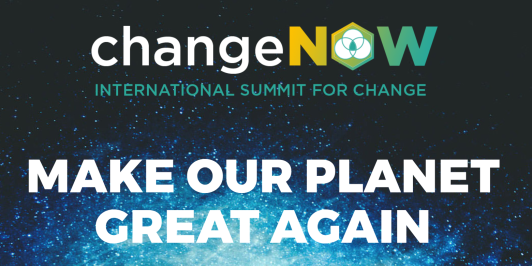 The ChangeNOW initiative simply celebrates all of those who are brave enough to make real change happen, and shape the future of our planet - they’re our changemakers. The severity of the environmental crisis needs to be acted upon, not only thought about. Over the two days, speakers will be addressing the most urgent global issues in inspiring and engaging sessions including the best innovators, entrepreneurs and thought leaders in the world; one of them being Katharina. The summit will be followed by a Changemaker-dinner under the patronage of Mr. Emmanuel Macron, President of France. Brave environmental enthusiasts are often marginalized but the summit puts them in a well-deserved spotlight, since it’s time to to make change happen, NOW!